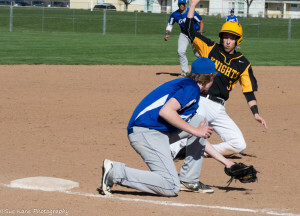 ROCHESTER, N.Y. — Sophomore Erik Johnson hurled a 3-hitter, and Christian Palawek provided a pivotal pinch hit single as McQuaid Jesuit downed Bishop Kearney, 6-0 in non-league action, Wednesday. Johnson struck out eight and walked one. After allowing a leadoff single to start the game, the sophomore left-hander set down the next 13 batters he faced. Johnson proved a quick study taking pre-game instruction from pitching coach Dusty Odenbach and adding a new weapon to his arsenal. Johnson has allowed two runs (one earned) over his last 14 and two-thirds innings of work (three appearances). He tossed a scoreless inning in relief against Clarence (Section VI) on Saturday. Last Tuesday, he went 6.2 in a 5-2 win over Livonia. Palawek delivered a two-out, two-RBI pinch hit single in a three-run fourth as the Knights took a commanding lead. With runners on second and third, Palawek drove a fast ball on the outer third of the plate up the middle to score Tyler Griggs and Gerry Dimarco. Palawek’s opportunity came as the result of effort during a recent practice. Danny Maxwell led the inning with a walk. After a stolen base and an errant pick off attempt at second, Griggs delivered with an RBI single. Dimarco also walked and the two runners advanced 90 feet on a wild pitch setting the table for Palawek. Dimarco singled home Jonathon Catapano as McQuaid added a pair of insurance runs in the sixth. Catapano collected an RBI in the first when his ground ball to the right side of the infield scored Nick Tomei. The Knights stole nine bases. McQuaid improved to 9-3 with the win. The Knights play at Victor on Saturday. An 11 a.m. first pitch is scheduled. More results from Wednesday’s Section V Baseball action. Behind the strong pitching of Jack Zielinski and a potent offensive attack the Sutherland Knights defeated the HF-L Cougars 14 to 5 at Sargent Field in Pittsford. The junior lefthander threw a complete game 5-hitter with eight strikeouts while surrendering only one earned run. At one point Zielinski retired 12 straight Cougars hitters in the victory. Sutherland pounded out 10 hits including 5 extra base hits in the win. Senior designated hitter Alec Vaules went 2 for 4 with a 2-run home run in the second inning and a run scoring triple in the sixth. Michael Ryan, Nate Richardson and Zielinski all had multi-hit games with Ryan’s hits being doubles. Richardson also recorded five stolen bases and three runs scored. Rounding out the offense was Layton Cummings who had three RBI including a two-run double. Nate Hampson delivered a walk-off hit for Victor. The sophomore also picked up his second win of the season in relief. Cadets erased a two-run deficit in the sixth.